In the action-adventure, motion picture hit, National Treasure, the historian-turned-treasure-hunter, Ben Franklin Gates (Nicolas Cage), is in a race to find and preserve crucial aspects of American history. While the high-energy movie plot is fiction, there are significant veins of truth woven throughout the production. Not the least of which is the reality that many of the world’s national treasures have indeed disappeared for lack of curiosity or recognition of value. It’s the same riddle of questions, clues and forgotten facts faced daily by one of the most recognized connections to America’s early transportation industry. 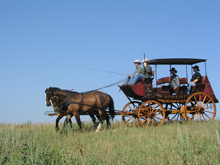 Located on the historic plains of South Dakota, Doug Hansen and his team of horse-drawn vehicle craftsmen have built more than an enviable reputation for themselves; they’re considered by many to be the ultimate authority when bringing America’s wheeled history to life. 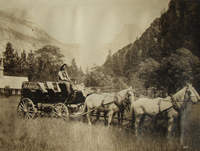 Recently, Hansen was tasked with the research and restoration of an early touring stagecoach from the Mariposa Grove in Yosemite National Park. The Grove is well known for the hundreds of Giant Sequoia trees in the area. While today’s travelers to the region enjoy the comfort and convenience of paved roads and motorized transportation, yesterday’s guests braved nature’s elements in open-sided coaches drawn by four to six horses. 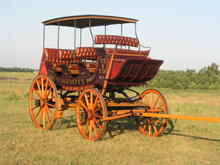 Dating to the late 1800’s, the coach sent to Hansen’s shops was designed with front, rear and side-mounted leaf springs as well as two inch wide steel tires and rear wheels measuring nearly five feet in diameter. Working together, these features are specifically engineered to help smooth out travel over difficult terrain. The coach belongs to the Madera County (California) Historical Society and, according to Doug Sordi, Vice-President of the organization, it shares a rich history with the ‘Big Trees.’ Abraham Lincoln first recognized Yosemite as a state park in 1864 and in 1877, the original owner of this coach, the Yosemite Stage and Turnpike Company, began passenger service to the Giant Sequoias in Mariposa Grove. Operating routes that ran more than 70 miles, the company placed stage stations at regular intervals to allow for horse changes, vehicle maintenance and other needs. 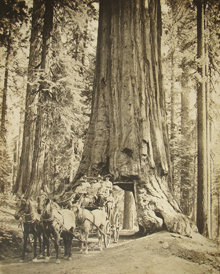 In the early days, just getting to the Big Trees was not without its share of excitement. Many of the trips took all day to arrive at the remote destinations. Along the way, coach drivers and horses, alike, had to negotiate steep, narrow mountain roads with sheer drops and switchback curves. Adding to the unforgettable journeys, the tour outings were sometimes met with the unexpected tension of masked gunmen demanding valuables. The first such event occurred in 1883 when passengers were coaxed at gunpoint to hand over $2,000 worth of cash and jewelry. Using an impressive compilation of period photography, patterns and literature along with decades of experience, the team was able to reconstruct the damaged and missing parts of the coach. Layers of non-original paint were painstakingly removed to determine initial colors as well as striping and lettering styles and locations. Interestingly, after the coach was received and its features were being cataloged, a small caliber bullet was found lodged in a structural frame member. Whether this coach had been victim of a holdup or merely a careless shot in target practice may never be known. From legendary overland mail coaches to lighter touring coaches like this one, the lure and legacy of a vintage stagecoach continues to make it one of the most important and sought after vehicles in any collection. Without exception, they’re one of the most recognized symbols of 19th century America. Just like the centuries-old Giant Sequoias of Mariposa Grove, these wheels are yet another national treasure; carrying a powerful spirit of independence while standing as a larger-than-life icon of the great American West. While gathering information for this story, the folks at Hansen Wheel and Wagon Shop sent us photographs showing the disassembled suspension springs from the touring coach. Stamped into the springs was the name of Betts Spring Company - San Francisco, California. The discovery of the Betts brand provides another interesting perspective to the significant role of American ingenuity and opportunity. As it turns out, when it comes to true western vehicle history, Betts is a thriving modern day icon. With a heritage tracing to 19th century England, the company began its operations in America in 1868. 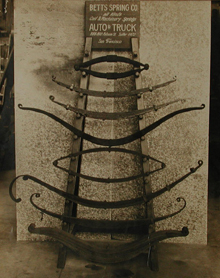 Among its early offerings were springs and related hardware for the horse drawn vehicle industry, cable cars and other products. 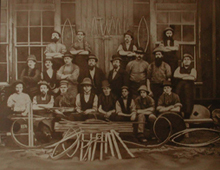 Company founder, William Betts I, is credited as being the first spring manufacturer west of the Mississippi and was awarded a gold medal for his achievements at the 1871 San Francisco Mechanics Exhibition. 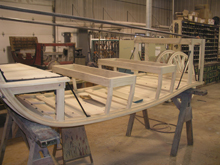 Due to its product innovation and diversity, the company was able to successfully navigate the passing of the horse drawn era and, today, is a recognized leader of innovative spring technology. Equally to its credit, after nearly a century and a half in business, the company is still owned by the Betts family. It’s an accomplishment unmatched by any other U.S. spring manufacturer. As a formidable 21st century competitor, Betts serves as a vital source of springs for the modern transportation industry and a myriad of other products including exercise equipment, mountain bikes, medical technology, military weapons and space shuttles. The vast connections early western vehicles have to America’s past and present never ceases to amaze us. Like the pursuit of other early world treasures, this discovery of a simple stamp in the springs of a touring coach is another reminder that greater awareness of our past can provide even stronger encouragement for the future.